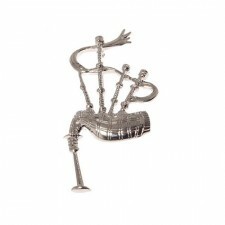 We have a lovely range of modern kilt pins and traditional kilt pins which can perfectly compliment your kilt outfit. We even have a clan crest kilt pin so you can proudly wear this with your own clan tartan kilt. Where should I wear my Kilt Pin? Kilt pins are usually placed at the bottom right hand, open corner of the kilt, two pattern squares over and up from the edge of the kilt. A kilt pin is made from sterling silver and all come in a gift box making an ideal gift for those who attend many Scottish themed occasions. 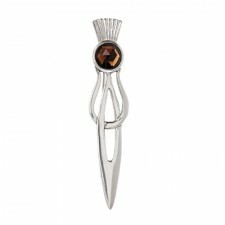 The kilt pin and the sporran are an ideal way to personalise your traditional highland kilt. Take a look at our range of men's kilts in a range of clan tartan.